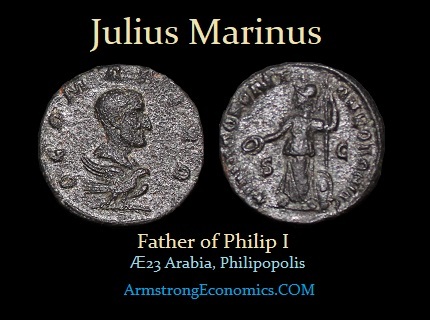 Julius Marinus was the father of the emperor Philip I and the grandfather of Philip II. He is known from the single coinage issue by his son issued at the city of Philippopolis. It is generally accepted that since his funeral was that of virtually afforded an emperor, it is believed that he was a man who was raised due to his intelligence and stature to that of a Roman citizen. This is most likely how Philip I became a Roman through his father. Nonetheless, Philip has been regarded as Philip the Arab throughout history distinguishing him from a natural born citizen of Rome.